Besides time, one thing moms usually need more of is energy. For months (okay let's be honest...years) I have tried various "diets" that promised to help me lose weight and feel amazing. Some were mildly successful in one area or the other, but it wasn't until I started really digging in to the science behind the food we eat that I decided to make a "lifestyle change" and give Paleo a try. In a nutshell, a Paleo diet means no grains, no sugar, no processed foods. By eating "like the cavemen" once did, we allow our body to rid itself of toxins built up in our system by overprocessed, high-sugar foods. I started eating a Paleo diet last year (on and off) for several reasons. I needed more energy. I wanted to shed some of my baby weight (nevermind my "baby" was over a year old) and I wanted to change the way my family ate in general to help my kids understand healthy choices and nutrition. I wasn't sure I would be able to stick to it since it did mean making some pretty drastic changes (no more bagels with my morning coffee? yikes!) However after the first few days, it really was very easy. Plan plan plan. I am a planner by nature so this part came very naturally to me. I created a 2-week meal plan and I posted cheat sheets with healthy paleo snacks on my refrigerator so I had a visual list to help me out. Once I had my meal plan and grocery list made, I headed to Fresh Market (my favorite) for a lot of my list, but was also able to find a fair amount of organic meats and produce at my local Kroger. Clean out your pantry/fridge/freezer. I assessed the items that I already had and gave myself a solid C from a "clean eating" or Paleo standpoint. I didn't want to just toss things that I knew were not Paleo friendly, so I made it a point to include those items in our meals over the next few days before I could get to the grocery and officially "start" our Paleo adventure. Other things I gave to friends so it wouldn't go to waste. You could even take all unopened items to your local food pantry if you wanted. Having a clean slate to start with is very helpful. Temptation can derail any kind of diet so removing things you shouldn't have will make things much easier. Watch local ads for deals. Local health food stores often send out weekly mailers with their specials. This week it's $4.99 for grass-fed sirloin. That's $3 off! You better believe I will be stocking up on their antibiotic and hormone free meat at that price. It is especially helpful to have an extra freezer or deep freeze to maintain stock of items like this so you can take advantage of deals when you find them. Experiment with recipes. Not sure what to cook? If you type in Paleo in Pinterest you will find a gazillion recipes and websites with lots of good information. In the beginning, I went with easy, low ingredient recipes so I knew I wouldn't overwhelm myself in the kitchen and lose interest. (I forgot to mention that I do NOT like to cook). After a lot of trial and error, we found a handful of recipes that we absolutely love and usually just stick to those spread out over the 2 weeks. Nothing wrong with eating the same meal every week! Stick to it! It might seem difficult at first, but I promise it gets easier. Once you give up your frequent dose of caffeine - whether it be coffee. multiple iced teas, or an afternoon Diet Mountain Dew - you will realize that eating the RIGHT foods naturally fuels your body so you don't need that junk. You will start to make it through the day without a 2pm crash. You will have energy to head to the gym after work or after the kids bedtime. You will most definitely see a change in your body - most notable for me was a 12 lb weight loss, clearer skin, and NO MORE BRAIN FOG (what I often called "mommy brain"). SO worth it! Overall I think the best part of eating a Paleo diet is the fact that you are not dieting at all. You can still eat so much amazing food - sweets included! - if you just commit to making a few simple swaps (almond flour instead of other grains for instance). 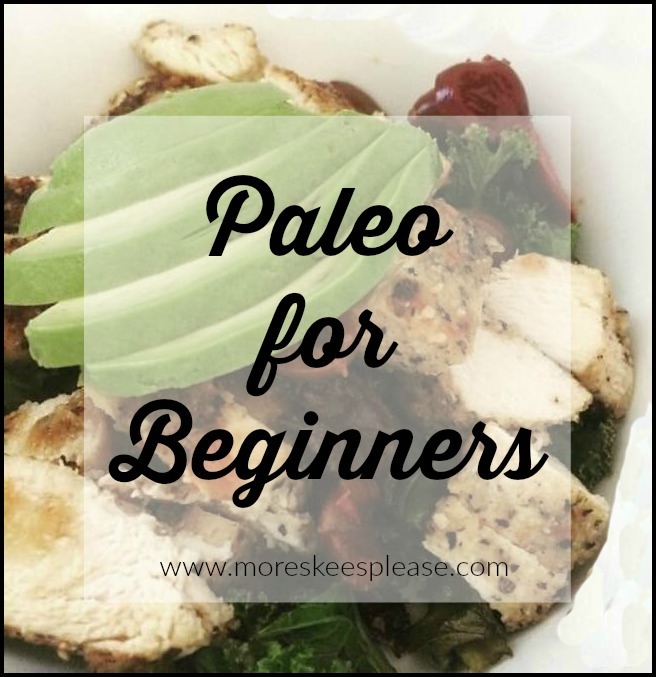 Have any of your own Paleo tips for beginners? Leave a comment below!